Measuring 9" wide x 6" tall with a 6.375" opening, enjoy the convenience of a hanging self-watering planter without the headaches usually associated with a hanging pot. 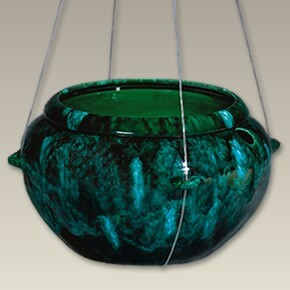 The 9" green colored hanging planter is easy to water through the hole near the inner pot, and because of its self-watering feature, only needs to be watered every one to three weeks. The hanging self-watering planter does not need a drip tray, and will not drip on your floor; Water is held inside the outer reservoir pot, so the plant can "drink" through the ceramic porous inner pot as it requires moisture. The hanging device is also locked into the outer pot, so the planter can't fall from its perch. These self-watering planters are great for any moisture-loving plant, including, but not limited to, African Violets, Asparagus Fern, Boston Fern, Christmas Cactus, Chrysanthemum, Grape Ivy, Swedish Ivy, Peace Lily, Philodendron, Poinsettia, and Spider Plant. Directions and a list of appropriate plants are included. Made in Thailand. Plant not included. REDUCED FROM $39.95.